Just off the square in Bonham, a little miracle is unfolding. 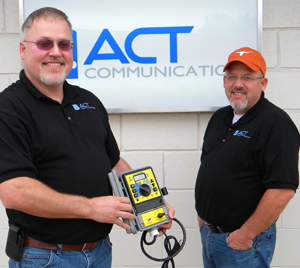 ACT Communications, a local success story in the 1980s and 90s, is on the rise again. Focused on the design and manufacturing of electrical and electronic products for the commercial, industrial and residential markets, the company is achieving double-digit growth during the worst economic downturn in decades. But financial results are not the whole story; old-fashioned business values and practices, such as listening to the customer and rapid deployment of solutions, are the foundation of their success. In January 1984, AT&T divested their local phone services and spawned seven new Regional Bell Operating Companies (RBOCs). The RBOCs, as well as new entrants in the long-distance telephone business such as Sprint and MCI, were now in the pool of potential customers for ACT Communications. Chasing competive advantages (higher capacity, higher reliability, lower cost), it wasn’t long before the the RBOCs and long-distance telephone companies started the fiber optics revolution. Fiber optic technology had been available from Corning since the 1970s, but AT&T, with no real competitors in the telephone business had not yet moved to the new technology, so the RBOCs inherited copper wire networks. Fiber optic cabling offered one thousand times more bandwidth over one hundred times farther distance than copper wire cables. Glaser quickly discovered gaps between requirements driven by fiber optics initiatives and the copper wire technology that he represented. If he didn’t change his business strategy, he could be left in the backwater. His brother, William “Bill” Glaser, joined the firm in 1984. For two years, they were road warriors, spending weekdays calling on telecom customers all over the country. They were united in common purpose, working for stock in lieu of salary, responsible for their own expenses. With its solid background in electrical engineering, ACT focused on cable location and surge protection. Because it is free from corrosion and not subject to electrical interference, fiber optic cable can be laid in the same trenches as copper wire, but first, the trenches have to be located, and during the process, employees must be protected from copper wire power surges. ACT designed surge arrestors whose primary function was to protect buried cable and personnel from high-energy surges. Building on the surge arrestor, they offered another solution to increase cable locating efficiency, allowing more than 50 miles of cable to be located with one transmitter. The telecommunications companies embraced ACT’s solutions, but each company required proprietary implementations. The Glasers listened to their customers’ problems, took notes, often on paper napkins over lunch, went home and developed a solution and, after further refinement, a prototype. The telecommunications industry’s efforts to reduce costs and improve productivity were hampered by an average concept-to-manufacturing cycle of two years. ACT Com-munications delivered consultative sales, engineering expertise, rapid prototyping and deployment, exactly what the telecommunications companies needed, and they did it with an alacrity that was unusual in the industry. It paid off. From 1985 to 1993, ACT, by then relocated to Bonham, grew steadily from a only a handful of employees to more than seventy. The industry “buzz” about ACT Communications grew, too. With its patents, product catalog, more than 150 customers, and depth of engineering and manufacturing expertise, ACT was a winner, benefiting from the wave of telecom investment in fiber optics (estimated at $14.6 billion in 1999). By 2000, ACT had two hundred employees, and several companies expressed interest in purchasing the company. General Electric (GE) walked off with the prize, purchasing the company in December 2000. Reorganizing as GE-ACT Communications, the new management apparently valued the company for its existing products and patents more than anything else. Almost immediately, they signaled an end to local product development and technical support by laying off or transferring twenty-five of ACT’s engineers. This wealth of expertise was scattered to the four winds, with some of the engineers finding employment within GE, some with competitors such as Thomas & Betts Corporation, and some in other parts of the telecom industry. Remaining employees strained to maintain customer good will without the technical backup that once was at the heart of the company. Over seven years, three more corporate reorganizations at GE resulted in the breakup of the ACT product catalog and re-assignment of products to different GE divisions. Following the then-current thinking (and tax advantages), decentralization was the rule. Product management was often delegated to division headquarters, sales and support to call centers, product engineering to India and manufacturing to China. Local employment drifted lower with every step. In early 2007, Greg and Ron had a conversation about their futures. Wistfully, they agreed they would love to work together to start another company just like ACT. Greg was certainly ready to come home to Texas. With time on his hands, Ron poked around the Texas Secretary of State’s Web site, where he was flabbergasted to discover that the company name was no longer registered and had reverted to the state. “The State of Texas had owned the ACT Communications name since 2005. Ron and I agreed to start the registration process immediately,” Glaser said, with a smile. Their curiosity piqued, they also started investigating the status of ACT Communications’ trademarks. For weeks, they were consumed by the task. Eventually, they found that many of the ACT trademarks registered with the United States Patent and Trademark Office had expired also, so they started the process to regain control of those important assets once more. Family members were skeptical and begged caution when the brothers told them that ACT was to be reborn. The terms of the GE sale included a seven year non-compete clause, which everyone had scrupulously honored, but the restrictions were about to expire, so that did not appear to be a significant problem. 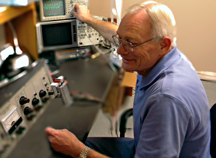 Ron Glaser delved confidently into the problem, analyzing customer requirements and evaluating current equipment, and then he re-designed the system from scratch, improving functionality, reliability and security. ACT was in back in business. And it is still in business with S-Industries, still providing key components for the company’s Automatic Insect Misting System. “ACT provided a product that gave us a real advantage in the marketplace,” said Sullivan. Before the buyout, ACT had 150 customers who purchased more than one million components. Many of their products were still operational, long past their two year warranty, but definitely near end-of-life, a perfect time to recover customers. Ron and Greg Glaser began knocking on doors, discovering both old and new needs. The engineers, led by Director of Engineering Fred M. Siebenthall, another ACT alumnus, were able to re-engineer legacy products, incorporating new customer requirements and evolved industry standards. In June 2009, the Fiber Hardware product line was introduced, providing the form, fit and function of all legacy fiber products. Three new patents are pending: a residential energy-saving device; a commercial application of surge protection and power filtering; and a device for converting wind energy to usable energy. Reflecting confidence in the quality of their sixty-plus products, all ACT Communications products carry a ten year warranty. As president, a post Greg recently took over from brother Ron, who decided he was needed more in engineering and sales. Greg Glaser’s nickname could be “E & E” (everything and engineering). He located a building near downtown Bonham and personally remodeled it to keep expenses down. He recruited employees, wrote policies and procedures, chose business systems, wrote product sheets, doing whatever needed to be done to get the start-up off the ground. Through their combined efforts, new markets are open. Working through commerical construction companies, ACT is now Wal-Mart’s only supplier of surge protection and power quality products. (Power quality is a concept dear to the hearts of electrical engineers, but beyond the scope of this story. If you want know more, ask an engineer.) The company has newly-minted Government Serivces Administration numbers, qualifying them as a military and government supplier. Phase Services, a sister company, has been established to assist electrical contractors with product specifications, installation and support. OEM opportunities continue to be uncovered by ACT’s manufacturer representatives. With more than $700 million in equipment damage claims being filed with North American insurance companies by home owners each year, the residential market for energy-saving devices, surge protection and power quality is an emerging market for the company. In 2008, ACT’s efforts paid off with more than 60 percent revenue growth. The future looks even brighter with more than 100 percent revenue growth forecast for 2009. I met Greg and his wife at Winstar from the Charlie Pride show on Sunday. Can you please pass along my note to them that I very much enjoyed meeting them, I’m sorry they were gone when I came back, and thank his wife SO SO much for her kindness. I know God Will Bless Her! !